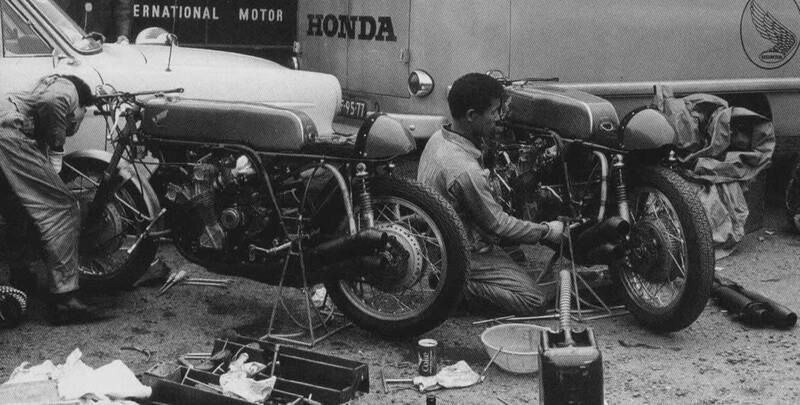 1966 becomes the absolute top year for Honda. They win the manufacturers' world championship in all five classes, for this year they also compete in the 500 cc class, and individual world championships in three classes. It is a unique fact, a record still standing today. Although during the years 1958-60, MV also won the manufacturers' title in all the classes they contested, there were only four classes then � and the competition of the MVs was weak, not to use the term non-existent. 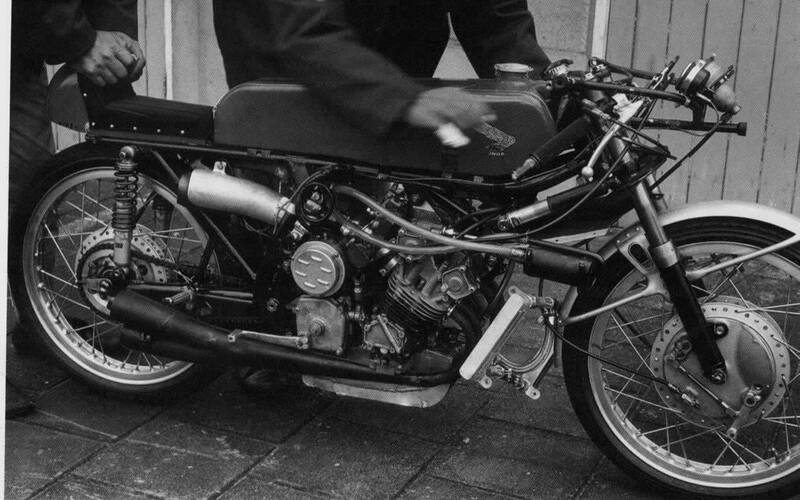 This year Mike Hailwood, arguably the greatest motorcycle racer ever, joins the Honda team as a works rider (his participation and resulting first world championship 250 cc in 1961 was as a privateer, with the Hondas on a loan basis). After Redman's retirement, Stuart Graham, son of the famous Leslie Graham, joins the team to assist Hailwood. In the 50 cc there's fierce competition between Taveri and Bryans on their Hondas, and Anscheidt, after the withdrawal of Kreidler, on a Suzuki twin. After the one but last GP of the season, the Isle of Man TT (this year one but last because strikes in Great Britain prevented the TT from being held in June as usual), all three riders have 26 points, and a chance of the title. Then it becomes known, that the Japanese GP this year will not be held on the Honda owned Suzuka circuit, but on the new Fisco course, whereupon Honda decides not to participate, and the individual title goes to Anscheidt. 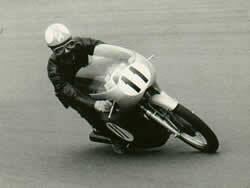 In the 125 cc class, the competition for Honda this year comes from Phil Read and Bill Ivy on Yamahas, not from Suzuki. Taveri takes the title, with Ivy second and Bryans third. The manufacturers' title goes to Honda, with Yamaha second and Suzuki third. 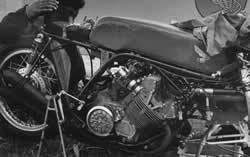 In the 250 cc class, Redman and Hailwood have to defeat the Yamaha four cylinders of Read and Ivy. 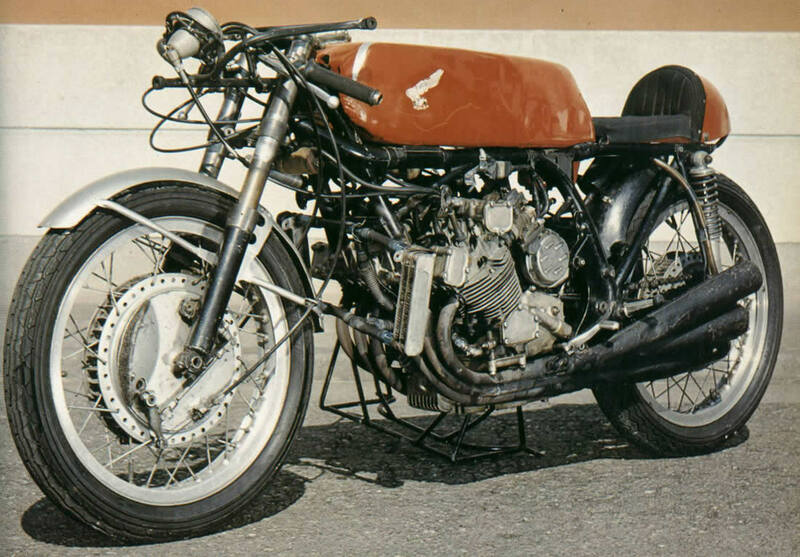 Although the Yamahas are slightly more powerful with 60 bhp, the combination of Hailwood and the Honda six is so superior, that Hailwood wins the first seven races and is already world champion halfway through the season. In total he wins 10 of the 11 races this year. Read is second and Redman, who breaks his arm in Franchorchamps and retires from racing, is third. In the manufacturers' standing, Honda is first, followed by Yamaha, MZ and Bultaco. In the 350 cc class, Hailwood wins the title with six victories, Agostini is second with three wins, and Renzo Pasolini (Aermacchi) is third. 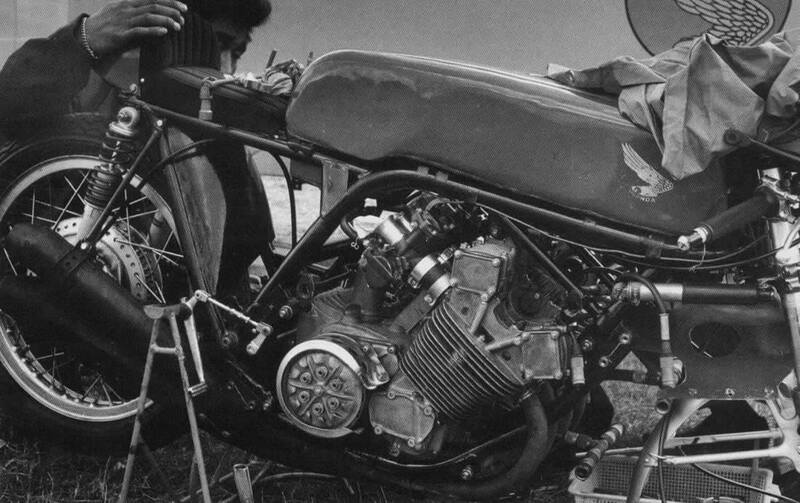 Honda wins the manufacturers' title, followed by MV Agusta, Aermacchi and Jawa. The 500 cc becomes a different story. Redman, who has decided that this will be his last season, wants to round off his career with a 500 cc world championship, so Hailwood will concentrate on the 250 and 350 cc, and Redman on the 500. In Germany Redman wins, with Agostini second. 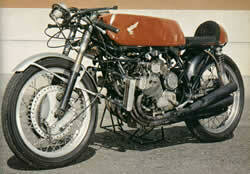 Hailwood can't compete, since there's only one 500 Honda. 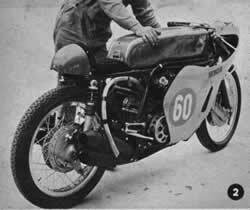 In Holland both Redman and Hailwood have a 500. Agostini initially leads the race, with Redman and Hailwood following. Hailwood overtakes both Redman and Ago, and takes over the lead, but crashes, and in the later stages Redman overtakes Agostini and wins. In Belgium, one week later, Redman has been fastest in practice, one second faster than Hailwood and over 6 seconds faster than Agostini, but, during the race, in pouring rain, he falls and breaks his left arm. Hailwood, although missing his top gear, builds up a lead of over a minute over Agostini, until further gearbox trouble forces him to retire, and Ago wins. Agostini now has the best chances for the world championship, with one win and two second places, while Hailwood has still zero points. 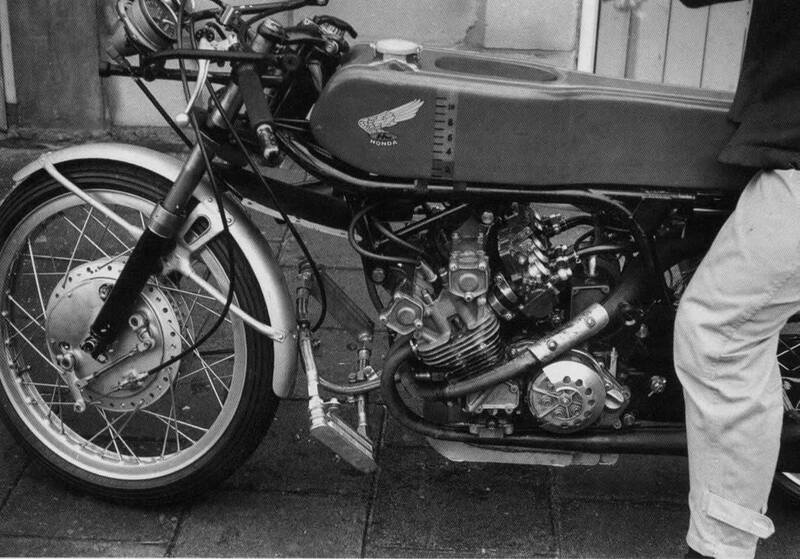 In East Germany again Hailwood retires. 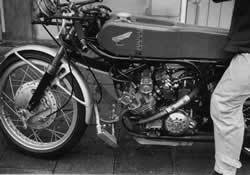 In Ulster all is well and Hailwood wins, and he also wins the TT on Man. By now Agostini has amassed so many points, that Hailwood has to win Monza to keep his championship hopes alive. He leads the race, but the Honda engine, normally a paragon of reliability, blows up, and Agostini is world champion. Honda takes the manufacturers' title, MV is second and Matchless third. Difference between the RC115 and the RC116 is a new bore and stroke, now being 35.5 x 25.14 mm. Power output is 16 bhp at 21,500 rpm. This means 320 bhp per litre and a Pme of nearly 16 kg/cm2 ! As regards bhp per litre, this is a figure that has never been surpassed by any naturally aspirated four stroke engine, and even today's formula 1 cars with their special fuel brews cannot hold a candle to it. I know this is not a totally fair comparison, but it gives an idea of the level of four stroke technology nearly 40 years ago. This engine is the most advanced of all the Honda engines. Red line at 22,500 rpm. Carburettors have flat slides. The gearbox contains a nine speed cluster. Dry weight of the bike is 58 kg. The piston pin has a diameter of 9 mm and weighs 6 g. The inlet valve head is 13 mm, the exhaust valve head is 11.5 mm, and the stems are 3.5 mm diameter. Weight of the exhaust valve: 6 g.
The RC148, used in the GP of Japan 1965, had the same bore and stroke as the RC 114, 33 x 29 mm, but the new RC149 gets the same dimensions as the RC116: 35.5 x 25.14 mm. 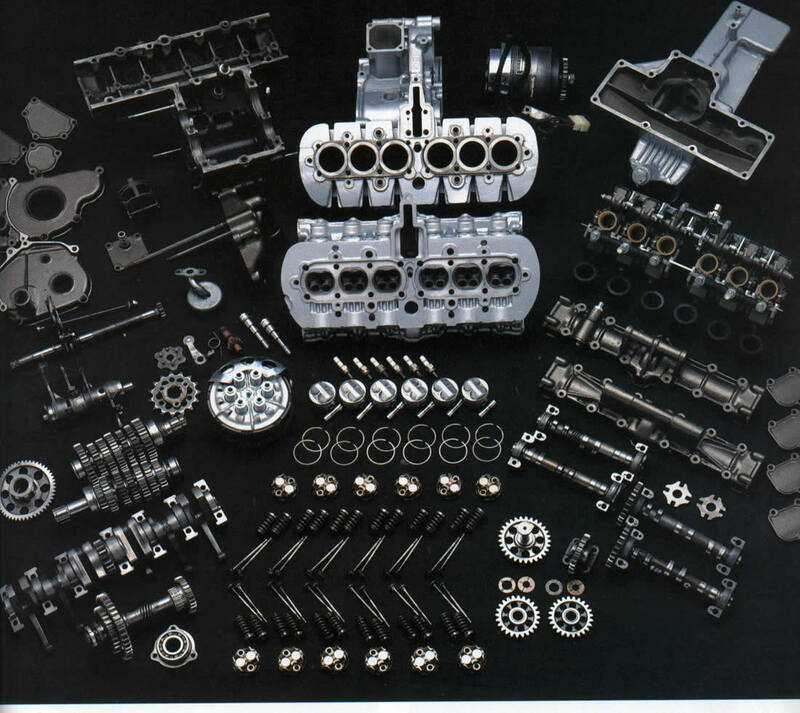 The crankshaft has a special configuration: the three cylinder part has the crankpins at 120 degrees, the two cylinder part has the crankpins, in the usual Honda fashion, at 180 degrees. Both crankshaft are coupled together at the position of the camshaft drive. The valve angle is 56 degrees, 24 degrees for the inlet and 32 degrees for the exhaust valves. Lubrication system is by wet sump, with two oil coolers in the sides of the fairing. Power output is 38 bhp at 20,500 rpm. If you're surprised that this is not 21,500 rpm, just like the RC116 : the complicated crankshaft reduces the mechanical efficiency somewhat, which results in a slightly lower Pme of 15.5 kg/cm2 and a 1000 rpm lower engine speed for maximum power. The polyester petrol tank has an unpainted strip, to check the petrol level. See images at right. 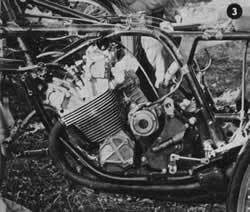 Although outwardly very like the RC165, internally the engine has been changed and now has a bore and stroke of 41 x 31 mm. See second image at left. Carburettors have cylindrical slides, although sometimes flat slides are used. Power output is 60 bhp at 18,000 rpm. Like the RC149, the bike has oil coolers in the right and left hand side of the fairing. Also new are the brakes, which have now radial cooling fins instead of circumferential ones. Dry weight of the seven speed bike is 112 kg. The RC173 is a completely new motorcycle, developed concurrent with the 500 cc RC181. Both bikes are virtually identical. External difference : the RC173 has round camshaft covers, the RC181 rectangular ones. The engines have now wet sump lubrications, with external oil coolers like the RC149 and 166. The carburettors have cylindrical slides. However, bore and stroke are the trusted 50 x 44.5 mm of its predecessor, and the gearbox contains six speeds. The megaphones have very pronounced reverse cones. Power is 64 bhp at 13,000 rpm. The frames have now bolted-on, twin front down tubes. See top image at right. Second image at right shows the Japanese mechanics working on the bikes in the paddock in Francorchamps. 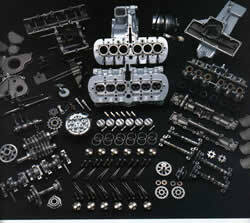 Bore and stroke are 57 x 48 mm for a total capacity of 489.94 cc. Total enclosed valve angle is 75 degrees, symmetrical, so both inlet and exhaust valves are hanging under 37.5 degrees. A weak point of the RC181 is its crankshaft � the press fit of the crankpins sometimes gives way, causing the crankpins to change position against one another, with disastrous results, a.o. reason of Hailwood's retirement in Monza.